Once time passed after 4qating, I let a bit more pass, and a bit more, and here we are in May and I'm finally putting a little report together. It's getting colder and darker in this part of the world. The mysterious, exciting time of the year. And I have to say this year is already on track to be the best of my life. Which means there have been times when Russ' absence has been so painfully intense and frustrating. Yet it is only because there has been so much presence that I can smile even at this. There’s a doctor who wants to look into my eyes today, 4 Feb 2013. Strange, there was a doctor who wanted to hold my hands this very day in 2004. Different town, different stones and oceans, but a familiar blend of coincidence and palimpsest. Man of the day, Hoban. Destination, Oban. Me, ‘lorn and loan and oansome’ at the Lorn and Islands Hospital. Nothing dramatic but it’s the best I can do in this gale, bag replete with the reqwyrt materials. Décor is dawn blue, highland water springs from the wall and piped music softly plays golden oldies… Leader of The Pack… Can’t help thinking about death in these places no matter how fresh and light, but everyone here is older than me, I swear. Twenty minutes of Kleinzeit, then I’m summoned by Dr. Z-something-old-testament. Slight and dark, he never smiles as he makes notes and pumps gallons of white light into my streaming eyes, hands me tissues and tells me the bad news. I’d forgotten Dr. Z. might want to see the birthmark on my retina – by the time my dilated pupils and I stagger back to the waiting room, there are looks of, “What is she on!” Now, how will I see to complete my 4quation? How drive to the supermarket? I can only do what people do here, wait. The distortions will pass; find a corner, pretend to read, and presently the place is empty; lunchtime. I spread everything out on the table and take the black pen to the A4 yellow, blinking. Big block caps. Fold it, name it, links and hints, plant it in a rack of NHS booklets on Implantable Cardioverter Defibrillators. As I leave, people are starting to arrive again. A tall sprightly man, wearing glasses and a navy-blue, Joseph Conrad/Russell Hoban cap, says he likes my hat, a fuchsia-pink beanie with sparkles. He asks if we can swap. He is walking towards the rack, smiling. I go out feeling sure he’ll be the one to find the yellow paper and smile some more. SA4QE day for me this year saw a mixture of feelings about a relationship. I hadn't planned on which quotations to use, but I did have to go out and meet someone that evening, and on the way out the door I grabbed The Medusa Frequency and a few sheets of yellow paper. Medusa was the first of Russ's books I read over 20 years ago and is still my favourite, and with its themes of love and loss and searching there was no better book to be revisiting given my personal circumstances. Consider this, said the darkness: any motion at any speed is a succession of stillnesses; any section through an action will show just such a plane of stillness as this dark window in which your seeking face is mirrored. And in each plane of stillness is the moment of clarity that makes you responsible for what you do. This is a well-known quotation from the book (in Hoban circles, at any rate) and to be honest I've never really understood the juxtaposition of the "plane of stillness" and the "moment of clarity" and the suggestion of responsibility. I suppose it means that in that plane of stillness you and your situation are frozen and held forever, a complete and entire snapshot of your world fixed and unavoidable in the cross-section. You know what your responsibilities are, and what effects your actions could cause, and you have decisions to make, and you have to live with the consequences. I copied down the passage on a sheet of the paper and pondered on it for a few minutes. There were other tables of people around, I considered handing it personally to someone and walking away, but wasn't bold enough to do it. I left it on the table, took my tea and got on my train. I had two seats to myself on the train and alternated between gazing out the window and pondering this and other passages from the book. I tweeted the quotation, then took photos of some of my own planes of stillness, which are reproduced below along with the quotation itself. Arriving in Euston I made my way by tube to Victoria and then to Peckham Rye. There was a woman on the Peckham train opposite me with short dark hair and eyes so big and deep you could swim in them. I couldn't decide if she was a Luise or a Melanie Falsepercy but she was wearing a Unison badge with the slogan "I love the NHS", the British National Health Service which our current government are so cruelly and wantonly dismantling, so on my way out of the train I touched her shoulder, told her I liked her badge and made my excuses. I'd never been to Peckham before and trying to find my destination proved tricky, even with the aid of the GPS in my phone. Directly outside the station was an actual crossroads, a pedestrian crossroads underneath a series of arches. It seemed to sum up what my life had become lately. I stood in this plane of stillness for a few moments trying to work out which direction to take. I went with the one that seemed best, turned right, turned around and ended up on Peckham High Street walking past one brightly lit shop after another. There were fresh food shops where you could buy sea bream, hen and goat. There seemed to be dozens of hairdressers, all of them busy. There were phone accessory shops with dark-looking men outside smoking guardedly. I met up with my companion for the evening and we used her phone's GPS to find our destination, a bookshop where Jake Wilson was talking about Russell Hoban and playing songs in his honour. It was a tiny shop with 20 or so invited guests and there were plastic tumblers of wine and there was a speech by Alexis Deacon who so beautifully illustrated Russ's last book Soonchild. Jake had a cameo role in Soonchild as a member of a band and the singing tonight was in honour of the concert at the end of the book. My friend and I stayed for as long as we could but living so far away from my home town meant I had to leave before the evening had fully finished. Jake's singing and playing were excellent. The next day he flew to New Zealand as part of his journey to Antarctica to play his songs about Captain Scott which he'd written with support from Russ. My companion and I found it a very moving event. Grey day, raining a little. It seemed fitting that I should seek out lions in Paris so I made a list in my notebook of some of those of whom I’d previously made acquaintance. Paris being the present resting place of one of Hoban’s old acquaintances, I thought I would go and introduce myself to Léonie, the “French sphinx” and eponym of the story My Night with Léonie from the collection The Moment Under the Moment. In Hoban’s story she is situated on the edge of the “Jardin des Tuileries at the corner of Avenue du Général Lemonnier”; it’s not far from my domicile and Tuilieries is on Metro line 1 ... the yellow line. I walked to the underground station ... pinned my first quotation amongst the day’s ephemeral CAPITAL and Capitol LETTERS to a broadsheet vendor’s hut just outside. In the metro, I left one tucked inside the folds of the quotidian underground journal. Then, I changed to line 1 (the yellow line); I passed a broken escalator being operated on during my correspondance. In line 1 at Champs Elysees, two men hopped aboard with a trumpet and oboe. It was still early and very busy inside the train, faces carried in the carriage through the darkness. As I alighted at Tuileries I left a quotation on my seat. 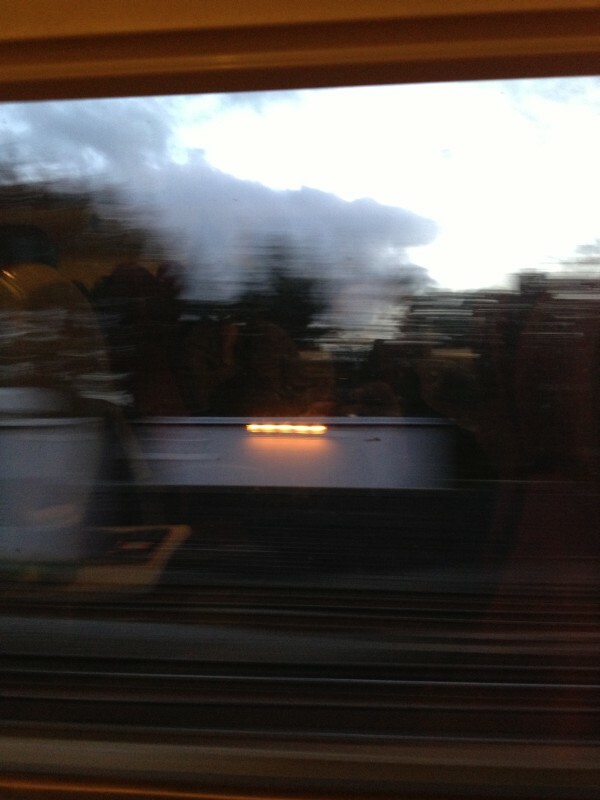 I attempted to snap a photograph from the platform, but was too slow to capture it. My eyes however, saw a woman pick it up, and she was engaged in reading it as the vessel sped away into the black. Arriving at the Jardins in the greyness, I lingered awhile with the fountain that was in the square. There were many statues. No sign of Léonie. At the north entrance, I saw two lions looking out over the traffic towards L’Arc de Triomphe ... I was affixing a quotation to one of them when the park security arrived beaming with their sunglass optimism in the brooding morning gloom; they did not take kindly to my bright enthusiasm and requested that I move along. I closed my eyes in their presence, then opened them again ... they did not go away; I did. They did not offer me a ride to the coast. And I found some other lions and a refuge from my hunters. I affixed one to a bronze sculpture in the park; Raymond Mason's La Foule (The Crowd). Hardly a chariot, but the lonely-looking the merry-go-round had tamed some lions to revolve about their business in constant circles. Many dark birds which might have been ravens were gathered about the chairs in the park ... I did not look in to their eyes. I left the black words for the black birds. Should the pedestrians have needed direction, I ensured it was provided. Having not seen Léonie, I thought I would enter inside the Louvre in search of appropriate drop-spots. The Louvre’s apparently endless expanse of labyrinthine exhibition chambers is always overwhelming; I thought I might find some of Léonie’s feline friends and relatives in the Egyptian section. I did. The statue of Athena always attracts a big crowd ... I left a quotation at her feet. A gargoyle in the corridor showed a half-head of a lion ... Tête de lion it was called. I paused; and placed a sheet at his absent paws. Back out into the greyness, and I remembered that I had still yet to see Léonie ... turning the corner on to the river, there she was. How strange to stand looking up at the figure I so often see when certain actualities of Hoban's writing rise up. For my mind, since reading The Moment Under the Moment the visual figure of Léonie works symbiotically with the actuality of the moment under the moment ... her figure on the cover of the collection distills through this unwordable language; flickering dual realities. I didn't stay there long. There was no moon. The banks of the Seine had flooded, and the river was high and murky. Under the tree, down on the quay I looked for the Head of Orpheus but it was not there; though there was a cabbage on the table when I arrived home in the evening. Shakespeare & Company kindly obliged to host a few sheets. Another in the Notre Dame free-ads pamphlets. Passing a yellow-fronted bookshop in Saint-Michel I left one in the children's section ... next to The Lion King. I had noted the Lion de Belfort as one to whom I should pay a visit. Now a third of his original size (maybe for lack of being fed beefsteak over the years? ), he stands in Place Donfert Rochereau in the fourteenth arrondisement. I took hermetic line 4 from Saint-Michel to Donfert Rochereau and came out into the square looking up at the great black beast. There were modern-day mechanical chariots whirling and roaring all around his devastating island, rendering intimate access impossible. There is a park from which one can see him from a safe distance, and from which he can see you ... I may have imagined a telephone box to be there too? I left a quotation attached to a bench just there. Only a couple of sheets remained. On my right, I was passing the Montparnasse cemetery ... since my quotation recalled letters that were carved in stone I entered on the east side. Found a tomb with these lions presiding symmetrically. I asked politely, and left the sheet in the middle so as not to offend their pride. I thought it fitting that the final resting place of my final quotation should be at the tomb of Charles Baudelaire. It was about time one of my favourite novelists made the acquaintance of one of my favourite poets. A close friend from London was staying with me and he and I had been to a bar in central Bristol. We took a taxi towards home and then a five-minute walk to arrive thereat. It was dark and we had consumed alcohol. But stopping in the silent road, no more than ten metres away from us was a lion. During the thirty-second motion stalemate we were dumbfounded, terrified; fascinated. After thirty seconds of the lion staring at us in the empty street, fear conquered us and we retreated at high speed ... we thought the lion would chase us. It didn't; it leapt away into the undergrowth. Large dog? Strangely formed deer? We are both entirely certain to this day that it was a lion we saw ... but I should like to know whose Bristol-based wheels are bitten.